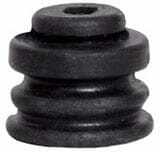 Qualiform is the rubber injection molding expert to turn to for all your custom grommet needs for vibration isolation. Each custom rubber grommet is specific to a certain application, not all grommets are alike. We formulate each custom grommet product to handle the vibration or minimize vibration that is specific to each application. We work closely with our customers to meet the standards they require. The grommets employ either transfer compression or injection molding which depends on the volume of the part and the geometry of the grommet.